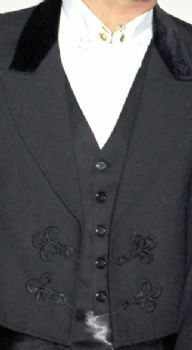 This is the traditional Portuguese waistcoat (chalequillo) with deep 'V' neck, single breasted and straight cut back, with five buttons at the front. For men. The waistcoat is optional when riding in authentic Portuguese attire, although tends to be worn by the majority of riders. Available in black or in grey.